When approaching a woman protected by a dragon, first be sure of the woman’s relationship to that dragon. Perhaps she’s in danger, maybe, but it’s equally as likely that she has complete control over the dragon, or that the dragon is just her friend. That’s the lesson that this T-shirt is teaching us. What if the dragon is in danger from the woman, huh? What if that woman is a fierce hunter that just happens to be in an evening gown? 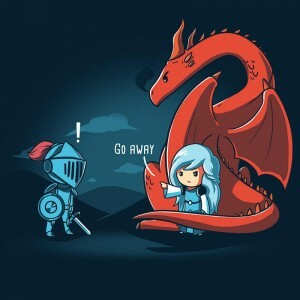 You can’t assume just because she’s a woman that the dragon is about to destroy her. Maybe the dragon just really likes her and wants to add her to his hoard. That’s a possibility. Then she’ll get all the shinies. Wrap this cloth around your torso to remind yourself to ask before saving.